If you want to change the look of a room quickly and easily, sewing your own curtains is a great place to start. When you make your own curtains you can select from unlimited fabric options to get the exact color, pattern, and texture you have in mind. You don't need to be an expert seamstress to tackle this fun home decorating sewing project; in fact, curtains are a great undertaking for a beginner. Before you begin, you'll need to measure your window to determine how much fabric to buy. Depending on the style you have in mind and the size of your window, you may buy anywhere from one yard to seven or more yards of fabric. First, figure out the length of your curtains by measuring from the curtain rod to the place you want your curtains to end. For a valance, a standard length is about 14 inches. For a typical window curtain, you'll need to measure to just below the window frame. For a full length curtain starting just above the window frame, a standard length is about 86 inches. If you place the rod at ceiling height, your curtains will be 96 inches or longer. If you want your curtain to "puddle" at the floor, add between one and three inches to the length. More length means a more dramatic "puddle." For a sleek, modern look or for curtains made of a heavyweight fabrics, you'll want your curtains to be about one and a half times the width of the window. For a four-foot-wide window, this would be about 72 inches. 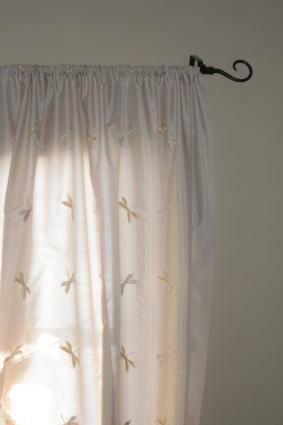 For a classic design and medium fabric weight, multiply your widow width by two to get the curtain width. For a four-foot-wide window, this would be about 96 inches. For a sumptuous look or for very thin, sheer fabrics, go even fuller, multiplying your window width by three or more. For a four-foot-wide window, this would be 144 inches or more. You can use a sewing pattern to make curtains, or you can easily create your own pattern for custom window treatments. Either way, the basic method for making the curtains is the same. The standard width for home decorator fabrics is between 54 and 60 inches. This means that, depending on your window width, you probably will not have to join fabric pieces to make the panels. Cottons and linens are easiest to work with if you're a beginner. You can find these natural fibers in many different fabric weights. Steer clear of satin and chiffon if you're new to sewing. If you select a heavy fabric like velvet or an upholstery-weight home decor option, you may need a sewing machine that can handle heavy duty work. To figure out how much fabric to buy, add five inches to your curtain length for the rod pocket and the hem. You'll need to add two inches to your curtain width for hemming the sides. A curtain panel is basically a rectangle of fabric, which is why it's easy to make with your own pattern. If you feel more comfortable, you can cut a piece of muslin to your dimensions and use that as the pattern for cutting your panels. If you're feeling confident, simply cut the panels according to the dimensions you need. Make a rolled hem on each side of the panel. To do this, fold the fabric over 1/4 inch on each side and press with an iron. Then roll the pressed edge over 3/4 inch and pin in place. Sew a simple straight stitch right at the folded edge to secure it. Press the hem neatly. The rod pocket, or channel at the top of your curtain panel, varies in width. To find out how large a pocket you'll need, measure the circumference of your curtain rod. Then divide the circumference by two and add half an inch for ease. A standard pocket is about two inches. Once you've decided on the dimension of the pocket, add another 1/2 inch for turning the raw edge. To make the pocket, fold the top edge of your curtain over 1/2 inch and press with the iron. Then fold the edge again to the desired pocket width, typically two inches. Pin securely and then sew in place with a straight stitch. Hang the curtains in the window. Check the length and pin the hem to mark it. Remove the curtains from the window and create a rolled hem at the bottom of the panel. Use your iron to press it neatly, and then hang the curtains again. You're done! Simplicity 1078 - This easy pattern can help you make several different styles of valances, as well as drapes and tie-backs. It retails for about nine dollars. Butterick B5057 - Make elegant draped valences and full panels with these moderately difficult patterns from Butterick. The collection retails for just over eight dollars. Singer Quick and Easy Window Treatments - This book of patterns available from McCall's has 15 different styles of curtains, all of which are easy to sew. The book retails for about $22. Choose a fabric that has enough width to accommodate the dimensions you need. That way, you won't have to join edges and match the fabric pattern. If you're really in the mood for an easy project, find a decorator fabric like silk dupioni, that has an attractive selvedge edge. This means you won't have to hem the edges of your curtain panels. For another easy option, make your curtain from a rectangular tablecloth. The bottom and sides will already be hemmed, and you'll only need to create the pocket at the top. Get creative with tie-backs. Try coordinating ribbons, decorative cord, or even strings of beads. For a different look, learn how to sew tab top curtains for your windows. Sewing your own curtain panels is a great way to add a custom look to your room. There's no need to be limited by the range of pre-made options available in the department store or online. Instead, you can create window treatments in the exact shade, length, texture, and pattern to really enhance the beauty of your home.